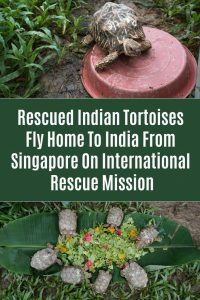 26th November 2018 – In a unique repatriation mission launched by Wildlife SOS India & ACRES Singapore, over 50 Indian Star Tortoises are finally flying to their rightful home in India from where they were originally smuggled and sold into Singapore as victims of illegal wildlife trafficking. 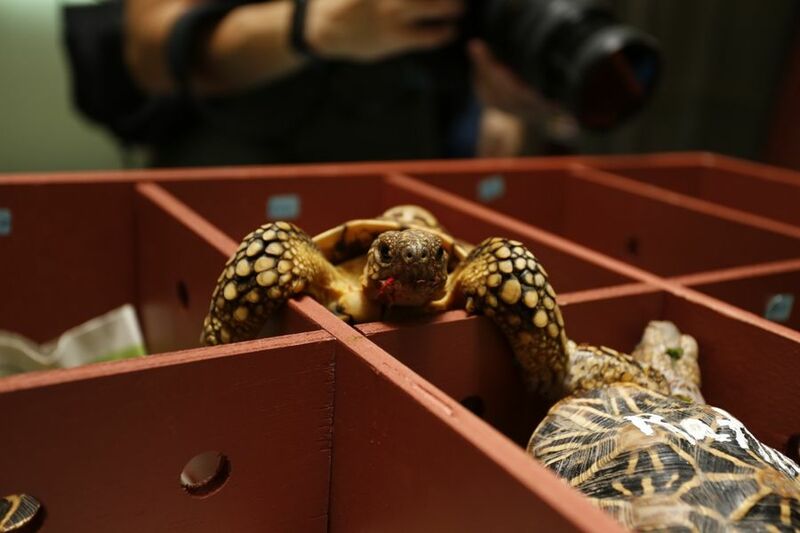 The tortoises were smuggled into Singapore illegally where they were confiscated by Singapore authorities. With cooperation from the Indian & Singapore Governments, they will now be repatriated to India and returned to their natural habitat in the forests of Karnataka. 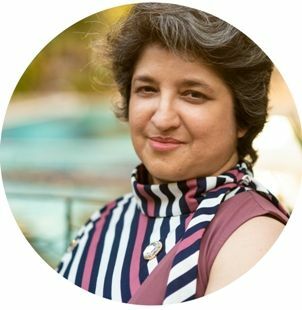 In a first-of-its-kind initiative, India based wildlife conservation charity Wildlife SOS working closely with the Ministry of Environment, Forests & Climate Change, Govt. of India secured permissions to repatriate the tortoises indigenous to India. Investigations confirmed Karnataka was the origin of the tortoises. 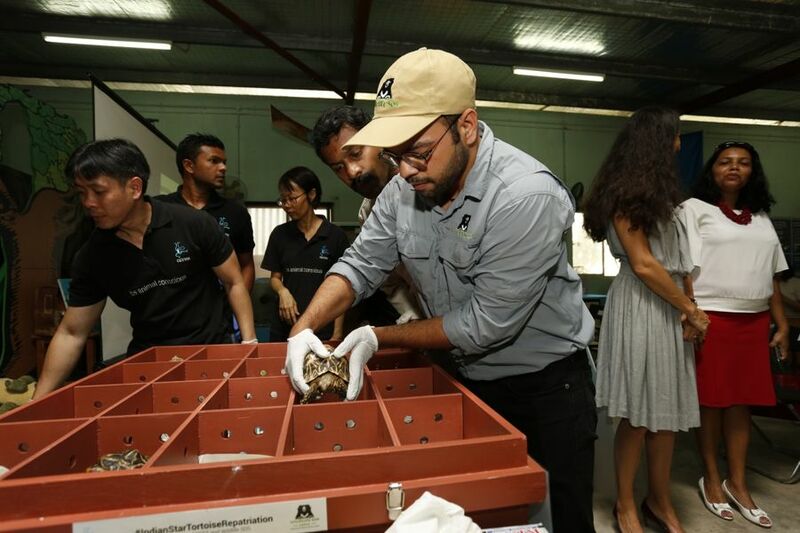 A team of senior forest officers travelled with Wildlife SOS CEO Kartick Satyanarayan to Singapore to conduct a physical inspection of the tortoises housed at the ACRES rescue centre. 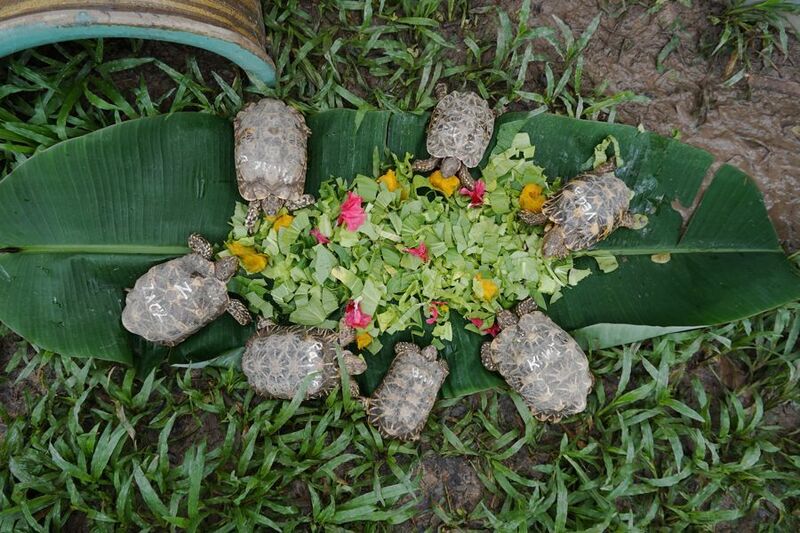 Singapore Airlines contributed to the cause of wildlife conservation by transporting the tortoises for free. A three-member team from Wildlife SOS India consisting of Veterinary Director Dr Arun A Sha, Special Projects Manager – Wasim Akram and Communication & Press Officer – Ms Arinita Sandilya accompanied the tortoises from Singapore to India. They were joined by a three-member team from Acres Singapore led by Anbarasi Boopal – Deputy CEO. The tortoises were transported in specially designed boxes for the long plane journey and upon arrival in India, received by a team from Wildlife SOS including co-founder Geeta Seshamani and former Chief Wildlife Warden and Head of forest force of Karnataka Mr BK Singh. 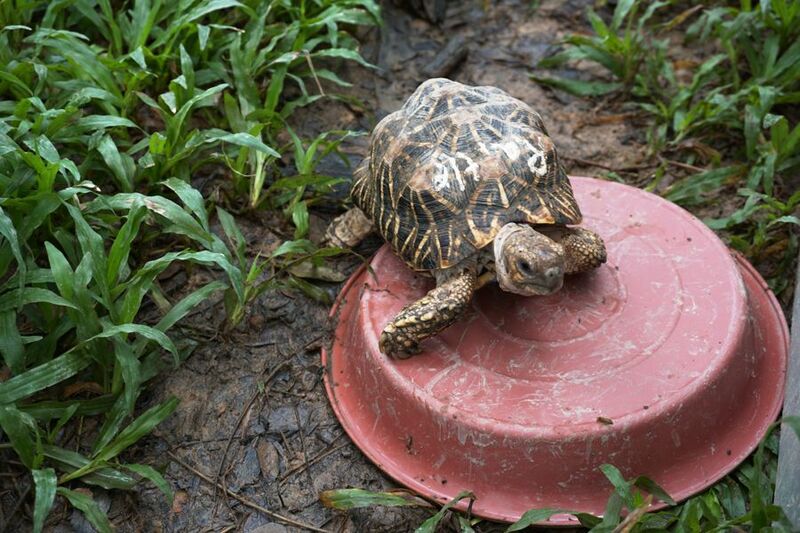 Once the tortoises have completed their quarantine period of 3 months, Wildlife SOS intends to initiate radio tagging and monitor these animals for survival. This landmark project not only helps augment the endangered populations in India but will also demonstrate the commitment from the Governments of India and Singapore and their zero tolerance to illegal wildlife trade. Indian star tortoise is protected under the Wildlife Protection Act, 1972 and listed in Appendix II of CITES (Convention on International Trade in Endangered Species of Wild Flora and Fauna), which regulates international trade of wildlife. Yet it is one of the most trafficked tortoise species in the world owing to the unique star-like radiating pattern on their shell. The Indian Star Tortoise is poached extensively for their meat and use of their body parts in traditional medicine as well as for the exotic pet trade. Illegal trafficking of tortoises from Southern India to places like Singapore, China, Honk Kong Thailand, Malaysia etc. fuel the demand for this species. Wasim Akram, Manager Wildlife SOS Special Projects said, “We have been working closely with the State forest department to identify a suitable location for soft release of these tortoises into their natural habitat. We will be installing radio telemetry devices (tags) to carry out post-release monitoring to ensure their survival in the wild. Wildlife SOS is a non-profit wildlife conservation organisation that aims to protect Indian wildlife, rescue & rehabilitate wildlife in distress, conserve endangered habitats & biodiversity, conduct wildlife research and create alternative and sustainable livelihoods for erstwhile poacher communities or those communities that depend on wildlife for sustenance. We actively run wildlife and nature protection projects to promote conservation, combat poaching & illegal wildlife trade. We work in partnership with the Government and indigenous communities to create sustainable livelihoods for erstwhile poacher communities. The Wildlife SOS Elephant Conservation and Care Center was established in 2010 & houses over 20 elephants with elephant care facilities. Incredible photos. It makes me so angry that this is still going on, especially since there are so many beaches where turtles and tortoises are getting trampled on. And there’s enough waste in the ocean that wildlife are at risk. Thanks for writing about the rescued tortoises, very informative and great quotes. Nice to know that you feel so strongly about this, Crystal. I feel so sad for those poor tortoises. Really a disgrace for humankind. But glad that they are safe now. Sincere thanks to the concerned authorities.